Good morning! Waves looking ok today on the north shore with rising swell to peak tomorrow. Got a few pictures from our friend Sumi in Japan who caught some nice abalone. Only in Japan can you find the traditional Ama-san divers "Women of the Sea" who go for these on a daily basis. How cute is this? Isamu the artist created this beautiful painting of Red Sea divers. We had a great time visiting them and can't wait to go back again soon. The past few days have been picture perfect here in Hawaii. Spring time is here and light and variable winds have been providing us glassy days in our islands. Went to the south side for a dip in the ocean. The tides have been really low in the afternoon so need to be careful when coming in from the surf. I saw a surfer step on sea urchin on the way in. The northshore was also picture perfect. Waves were going off and was too tired to take any pictures but got one from the road. See the vog? Weather will be trades for tomorrow before the winds switch back to southeast just in time for the weekend warriors. Sunday should be bad weather so plan your days accordingly. Northwinds arrived on schedule and surf was small so you know what that meant...Go Dive! Conditions were nice and since I had to test my new 5-mil wetsuit, today was the perfect day. Kirby invited me to join him on a quick "kau kau" dive of the southside so off we went. We were greeted by a pod of dolphins (around 40+) so we jumped in and swam with them first. I was too buoyant with the wetsuit so had to adjust my belt doubling my weights. A good rule of thumb is to be neutral at 30 ft.
Got me one for the steamer. These fish are the smartest fish of all the reef species. They have these big eyes (aka big eye emperor) and can see you from a mile away. There are a few tricks to bring them in close and today I found out another method that worked perfectly. Another Chilly morning in paradise. Northwinds shifting trades then variable again by the weekend. Prior to the cold front, Travis and I got in a dive while the winds were light. Heavy clouds loomed the horizon as this was the calm before the storm. Last night I watched "Perfect Storm" and could only imagine the rough seas they went through. Rain or shine, it didn't matter cause we were underwater. Travis got a nice Mu (big eye emperor) and he was stoked. These are really hard to spear and if you know the tricks to call them in close you can get one. We also got more kumus that should last for a few meals. The 2010 Red Sea New Years Party was a blast! 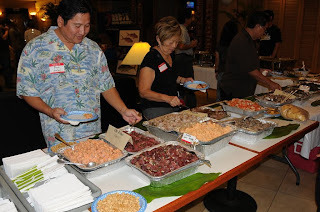 We had guests from all over the islands attend the event and lots and lots of ono food! Every kind of poke you could imagine was there, opihi, tako, opah, thanks to all our divers for helping catch these. 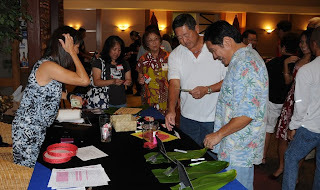 Terry Yonashiro even brought out his secret Nenue and Omilu recipes. 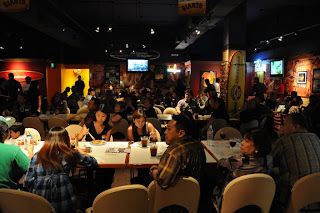 The event supposed to go till 9:00 pm but we ended closing down the place at 1:00 am. It was almost standing room as people flocked in to grab a seat. Slideshows, videos, and clients shared their stories of their past Red Sea trips. 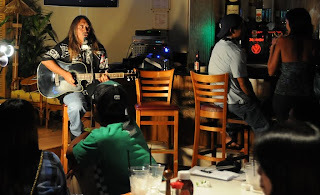 Live music from Molokai's Eddie Tanaka and Oahu's Travis Masutani rocked the house. 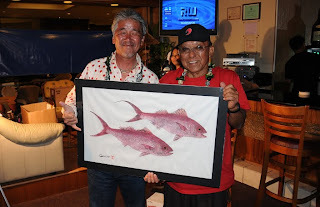 Lots of giveaways and our friend who came from Japan, Kimura-san took home the traditional Onaga Gyotaku print by Crow. Thanks again for everyone's support with Red Sea Ocean Adventures and we hope you all can make it to next years party!